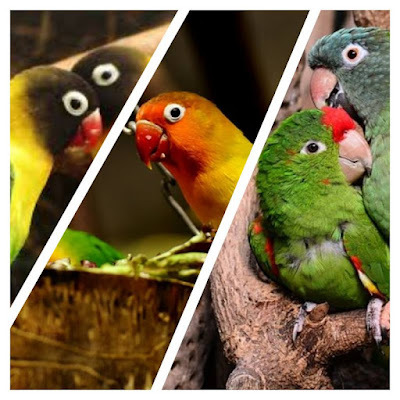 Lovebirds are very popular pets and are good for first-time bird owners. These birds are great pets for older children but may be a bit too nippy for younger children. They are quiet birds so they can live in an apartment with you. Lovebirds can also be friendly with all members of your family if they are hand-fed and socialized from a young age. They can become nippy as they mature if they are not properly or consistently handled. Lovebirds need to be kept singly or they will bond with each other rather than you. The most popular types kept as pets are the Fischer’s Lovebirds, Masked Lovebirds, and Peach-Faced Lovebirds. Make sure you buy a young bird rather than an older one because they are easier to tame from a young age. You can tell that one is younger by the amount of black on his beak–the more black, the younger (this may be different with different color mutations). The black Lovebirds normally disappears when they are 4 months old. If you are able to provide your bird with adequate care and love, then this might be the perfect bird for you. Name Lovebird (Agapornis) Origin Africa and Madagascar Size 4-7 in., 50 grams Color Differences There are a lot of different color varieties to choose from. Lifespan up to 20 years Noise Quiet–they are able to live in an apartment with you. Qualities Need to be well socialized with members of your family, need to be kept singly, can become nippy, males are less temperamental than the females Lovebirds, curious, very energetic, playful, love to go inside things (so a hanging bed or hut should be provided unless it causes aggression), great first-time birds. 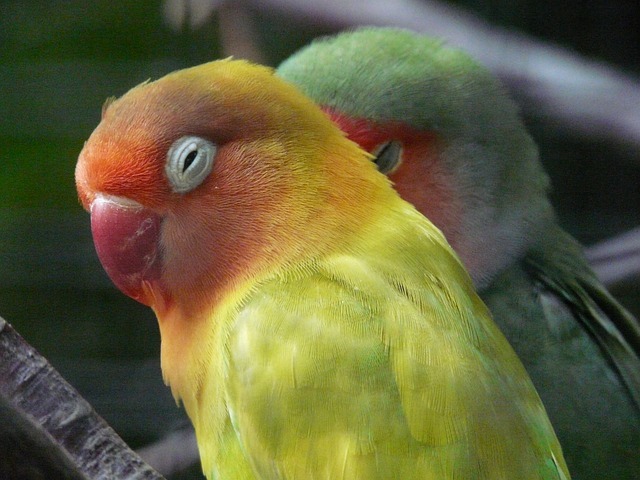 Lovebirds' abilities Low–most don’t learn to talk, but they are able to be trained. Interaction/Time Requirements They need daily handling in order to be well socialized and less nippy. Your pet bird needs a certain type of small bird or parakeet food. There is no one-type-fits-all when it comes to your bird’s nutrition. Feeding your Lovebirds the right food is absolutely essential to his health (and lifespan!) Feed your bird seed and water just isn’t going to cut it. And feeding different types of birds the same diet doesn’t work either. It’s important to provide a diet that is safe, healthy, and yummy. Packaged small bird and parakeet food come in all shapes, sizes, colors, and ingredients. So, it’s important to know what is the best diet for your individual bird. When shopping for food, there are a lot of things you need to take into consideration. Lovebirds follow a very similar diet plan that we do. Here is the recommended diet percentage for each type of small bird and parakeet food that should be a part of your bird’s diet: Grain Products – 50% of diet Whole grain products provide your bird with the necessary proteins, carbohydrates, and various minerals and vitamins. Tortillas Triticale Wheat berries Pelleted diets are made by combining a variety of healthy ingredients into a mash and then creating pellets of different shapes, sizes, colors, and flavors. Pellets offer a more balanced nutritional diet for your Lovebirds in a form that is easy for you to serve and reduces the chance that your bird will pick through his parakeet food and avoid the healthy food he really needs. Pellets have replaced the old seed-only diet and now are offered as the primary base diet for many pet birds (but should NOT be offered alone). If your bird is on a seed-only diet, you will need to convert him to a pelleted diet. Diet Mixes Because feeding your Lovebirds a variety of foods is best, there are a small bird and parakeet food mixes available that include wide ranges of different types of food. They can include seeds, dried fruits and vegetables, nuts, whole grains, and more. If you honestly don’t have enough time to offer your Lovebirds a fresh diet variety all the time, diet mixes can be a great thing to have on hand. However, keep in mind that offering healthy pellets and fresh food on a regular basis is still necessary for your bird’s nutritional variety and health. Vegetables & Fruits (45% of diet) Vegetables Vegetables are a very healthy and important part of your Lovebirds diet. Most vegetables are best served cooked, but some can be served raw. Always wash vegetables thoroughly before serving and chop them into appropriately sized pieces. Potatoes (cooked) Pumpkin (cooked) Pumpkin seeds (cooked) Radishes Soybeans Spinach (in moderation) Sprouts Squash (i.e. acorn, butternut, Hubbard, etc.) Sweet potatoes (cooked) Thai pepper Tomatoes (cooked and dried) Watercress Yams (cooked) Zucchini Fruits Fruits are another healthy and necessary part of your Lovebirds' diet. Keep in mind that fruits have more water content than vegetables so your bird’s droppings may be runnier after feeding him fruit. And make sure to always thoroughly wash all fruits before serving them. Pomegranate Raisins Tangerines Dairy & Meat (5% of diet) Dairy Even though birds are lactose intolerant, they can still have some dairy in moderation (SMALL amounts!) Dairy products provide an excellent source of calcium, so they should be included as a very small part of your bird’s diet. Recommended Dairy Products Cheese (used in cooking only) (cheddar has the highest fat and calories) Cottage cheese Eggs (including clean shells) Yogurt Meat Yes, birds eat meat. And it’s good for them! Most bird species are seen eating insects and larvae in the wild. In order for your bird to get a good amount of protein, a small amount of meat is good. Meat must always be cooked thoroughly before serving–NEVER rare. Recommended Meat Products Chicken Fish (remove bones) Lamb Liver Ribs (beef) Roast beef (well done) Salmon (water packed canned is best) Steak Tuna fish (water packed and low sodium) Turkey Seed, Calcium & Treats ( Seed Even though seed is a natural part of bird diet in the wild, it doesn’t even make up half of what they eat. 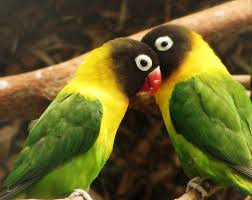 Most wild Lovebirds eat leaves, stems, vines, shoots, vegetables, fruits, seed, flowers, insects, and insect larvae. 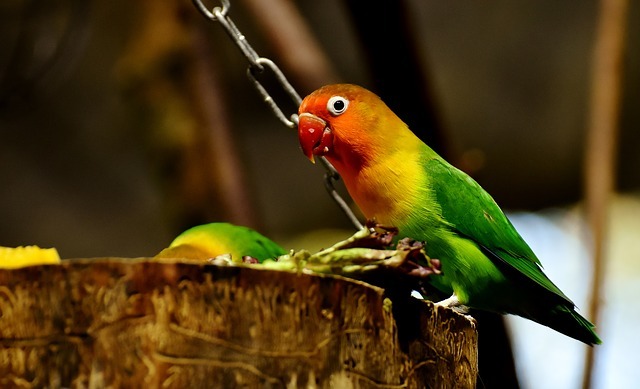 Lovebirds in captivity have the same dietary needs, so feeding your bird an all-seed diet is simply not enough. Seed is high in fat and full of oil. Many Lovebirds become obese from seed diets as well as contract fatty liver disease. Seed is low in many vitamins and minerals, so feeding your Lovebirds a seed diet can cause all kinds of deficiencies as well. Seed is good for an occasional treat and is great to use as treats during training. Other than that, a seed is not good for your bird and you should instead focus on feeding him a variety of the small bird and parakeet food mentioned above. Calcium Small birds also need calcium. The easiest way to give your Lovebirds the calcium they need is with cuttlebone. Cuttlebone provides your Lovebirds with the calcium he needs as well as helps to keep his beak trimmed. There are also some popular toys that contain calcium that can be fun for your birds as well. Recommended Calcium Products Treats The most common treatment for small birds is millet. Millet is a very popular treat and is like candy for birds–most small birds LOVE it. Lovebirds adapt well to average family unit temperatures, not to surpass 80°F; be wary of extraordinary temperature changes. The environment ought to be set off the floor in a region that is sufficiently bright and far from drafts. A living space roughly 18"W x 18"D x 24"H, with metal bars dispersed no more noteworthy than 3/8" separated, makes a decent home for a couple of Lovebirds; a flight territory is emphatically suggested. It is best to give the biggest natural surroundings conceivable. Roosts ought to be no less than 4" long and 1/2" in breadth; an assortment of roost sizes to practice feet and help anticipate joint inflammation is suggested. A metal mesh over the droppings plate will fend off the flying creature from droppings; line the droppings plate with living space paper or suitable substrate for simpler cleaning. To stay away from tainted, don't put nourishment or water compartments under roosts. 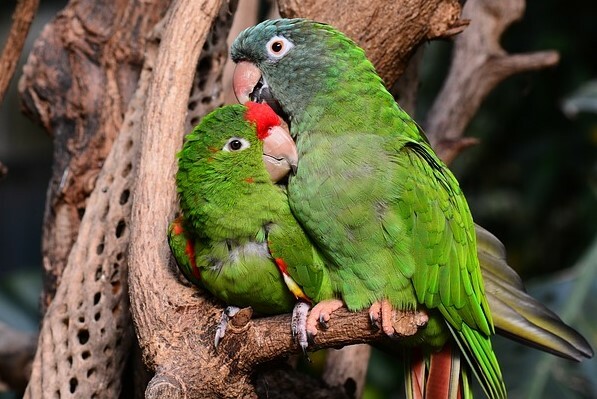 Lovebirds can be kept alone to bond with pet parent or in sets to bond with one another. Diverse kinds of winged creatures ought not to be housed together. Flying creatures ought to be mingled day by day by the pet parent. Cocktail Bird Care Click the Link For More Details. Best Tropical Fish click the link for more details. Labrador retriever Dog Click the link for details.